In the world of personal computers, we can always divide the users into two main camps. There are the everyday users that don’t have any sort of knowledge about their computer, let alone their hardware. These users just want their computer to work and they don’t bother with any specifics. On the other hand, we have the so-called „enthusiasts“ who want to know as much as they can about their PC and this kind of people are always looking for more information. They are always looking for a way to improve their PC’s performance and they actually care about their hardware a lot. 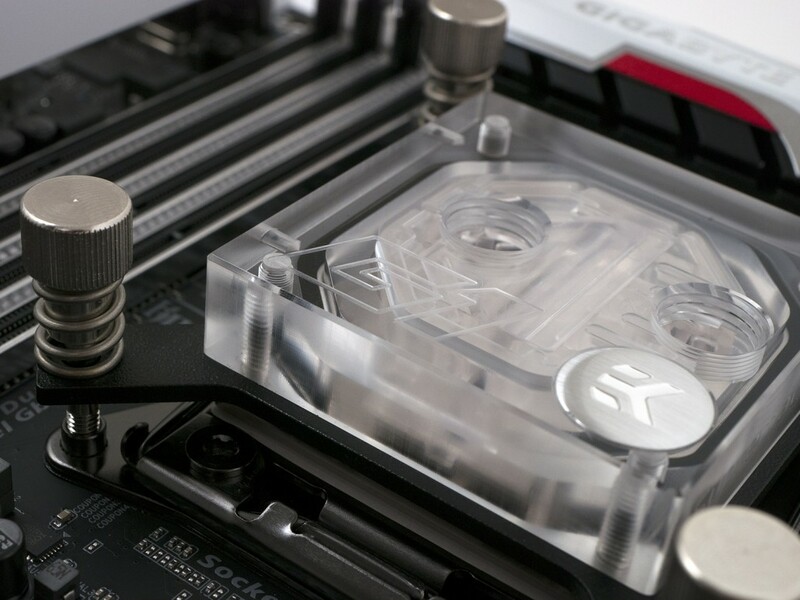 Questions like “Should I get an aftermarket cooler?“, “Is my chipset temperature too high?“, “Should I get liquid cooling?“, “Should I watercool my VRM?”, etc. are common among enthusiasts. So, if you are reading this article, you are either a PC enthusiast or on your way to be one. Maybe some of these things that we are writing about are trivial for some of the readers, but we need to remember that none of us were born with all this knowledge. We have all read it somewhere or someone told us. That brings us to the subject of this article, or “What is Delta-T?”. 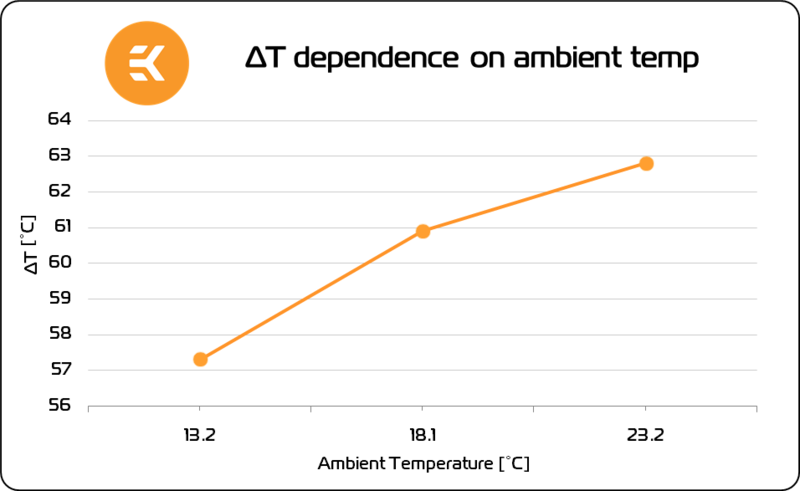 Delta-T, often marked as ΔT (Δ – the Greek letter Delta), is a way of expressing temperature differences when conducting temperature tests and cooling performance comparison. Officially, ΔT is used in precise timekeeping measurement, since „T“ can stand for „time“, so don’t get confused if you see it somewhere else. After all, the uppercase delta (Δ) is commonly used in mathematics and physics where it simply marks the difference or change in something. For example, Δx=x2-x1 or Δt=t2-t1. 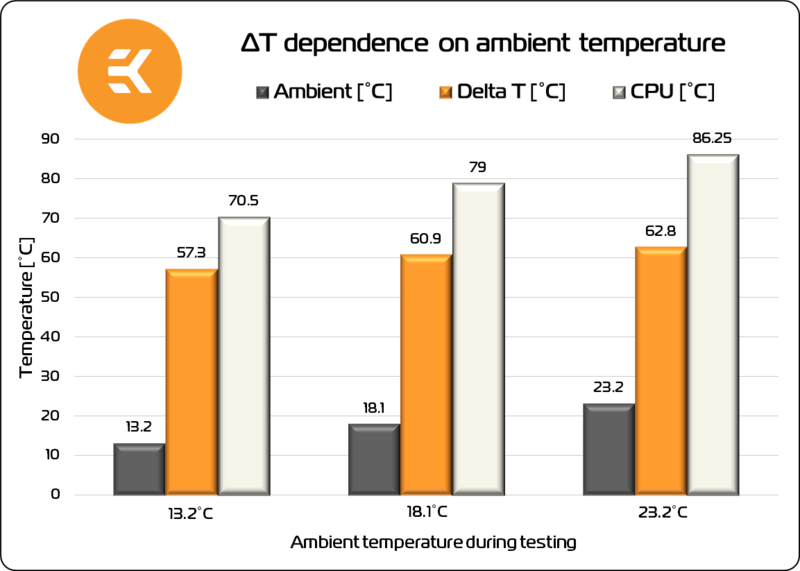 Delta-T or delta temperature, seen in hardware reviews and cooling performance tests always stands for the value that you get when you subtract the ambient temperature from the measured temperature. That is to say, if the ambient temperature of the room where the test was conducted was 23.8°C, and the measured CPU temperature was 82.5°C, ΔT = 58.7°C. An example of direct temperature measurement. 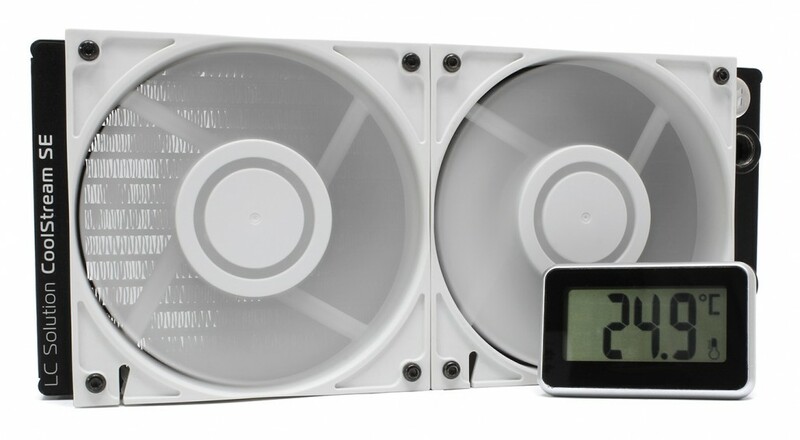 With conventional temperature comparison, you are limited to finish your hardware testing in one day, or even a shorter period of time, simply because the ambient temperature of the room can change. The cooler tested one day can give slightly different results on other days. 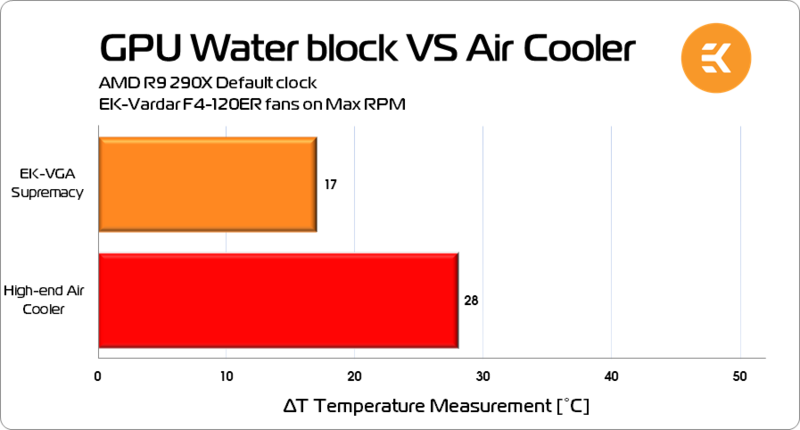 In more extreme examples, the cooler that you test in the summer with ambient temperatures of 26-28°C will give significantly worse results if you were to test the same cooler in the winter when the ambient temperature is 20-22°C. The advantage of ΔT is that the reviewer can stack up and compare results that were taken during longer intervals of time. The person conducting the test just needs to subtract the ambient temperature from the measured temperature in order to get a consistent result. But (and there’s a “but”) this kind of subtracting and adding can only withstand a certain amount of ambient temperature fluctuation. 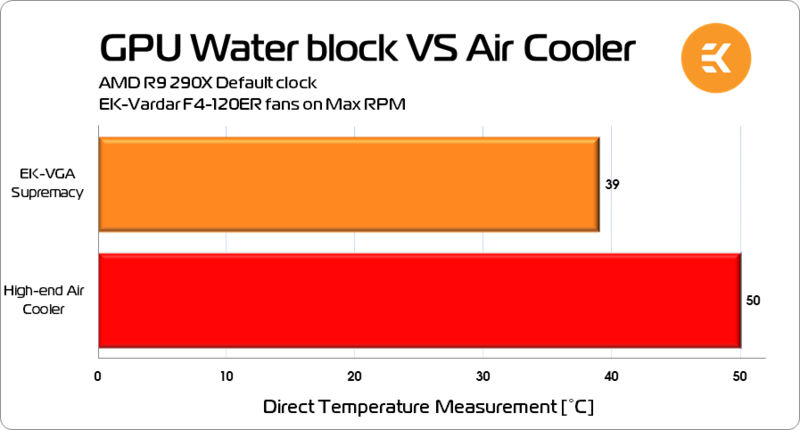 In the world of high-performance coolers and water blocks, even a slight advantage od 1-2°C in performance can declare one manufacturer a looser and the other one the winner. Badly conducted hardware tests and reviews often leave the end user with false information. The issue with ΔT is that „temperature“ is not a kilogram of sugar that you can add and subtract any way you like. From the standpoint of physics, temperature represents the kinetic energy of the particles and molecules. Therefore, if a gas like air or a liquid like water has a higher temperature, it means that the air/water atoms are moving around faster, with greater kinetic energy. This brings us to the well known Pressure-Temperature law (Amontons’s Law of Pressure-Temperature) that says that the pressure and temperature are directly dependent. The high temperature of boiling water results in high pressure. We will not bother you with any more details and we hope that this explanation is convincing enough for the fact that you cannot simply put the temperature on a scale, subtract values and expect the ΔT to be constant. Just to prove that, we have a test that was run several years ago on a 1366 platform and an overclocked Intel® Core™ i7-930 processor (4.3GHz at 1.408V). The test was set up so that the same air cooler was tested at different ambient temperatures. The air cooler was not removed, the thermal paste was not changed, everything was the same, except the room temperature. It was a nice winter day, with close to 0°C outside, and therefore the room temperature was lowered to 13.2°C. A simple LinX stress test was run (test 1), and the room temperature was raised to 18.1°C. The stress-test was run again (test 2), the CPU temperatures were recorded, and the room temperature was raised again to a final 23.2°C. Afterwards, the stress-test was run one final time (test 3). So… You would expect the ΔT to be the same for all three CPU stress tests? Well, it wasn’t. As the room temperature raised, so did the ΔT and it changed by 5.5°C in total. You could also see the same change in ΔT with liquid cooling if the ambient temperature fluctuations were this severe. And it’s not just because of the physics of heat transfer, it’s also because the electric resistance of conductors and semiconductors fluctuates with the rise of temperature. Conductors and most of the semiconductors have lower electrical resistance on lower temperatures, and lower resistance ultimately means less energy loss in the form of heat. Well, what does it all mean? Is using ΔT for hardware and cooler performance testing wrong? No. Both ways can be wrong because hardware testing is a very delicate task. With cooler performance testing, there is a great number of variables. How was the thermal compound applied, and what quality was the thermal compound (Thermal Compound Guide)? Was the base of the cooler/coldplate flat, and did it make good contact with the IHS? What model of CPU was used to run the test? A CPU that has soldered IHS or a newer model that cries for delidding (What is delidding?) perhaps? So, so, so many variables are involved in cooler performance testing, and the ambient temperature of the room is just one of them. In most cooler performance tests you will see real temperatures that some hardware monitoring software would read, and these values are put into a chart. Results expressed with ΔT will always be lower than real values, since the ambient temperature is subtracted, and that’s the basics that you need to know about ΔT. In the end, it’s all the same – in every cooler performance test „lower is better“. What useful information can be concluded from this article then? Well, we have explained what ΔT is and how it’s used. Like any other testing method, ΔT can be misused, and there is only one message from us: Question everything! Choose your sources well if you can, and verify your info with multiple sources. Until next time, take care!